It was a night of surprises, all brought upon by social media. I ended up meeting an old friend of mine from the Armenian Youth Federation days. Through the course of years I have met many new friends and got reacquainted with old friends, as one’s life takes changes in directions. My friend was a musician in one of the Armenian bands of my youth and he played at many weddings, conferences and affairs that I attended through those years. I saw a notice that he had posted that he was entertaining with another friend at a location, about a half hour from where I live, so I asked my Bride if she would like to do something different, as I was sure that it was going to be popular music, and she and I both hoped that there was going to be a small dance floor. It was the first time that I had ever heard my friend play popular music and for the most part they were now considered standards from my generation, but what was even more surprising to me, was that my friend also played the saxophone, which I never knew. He told me that he only took up the sax about a year ago, but that he also played the clarinet, another instrument that I did not know he played. Life can be full of surprises. Milford is a charming community, a little off the beaten path, even by way of the freeways. It has a very quaint downtown area, and for years it had the honor of having the oldest continuous men’s clothing store in the state, but alas they finally showed their last set of attire. 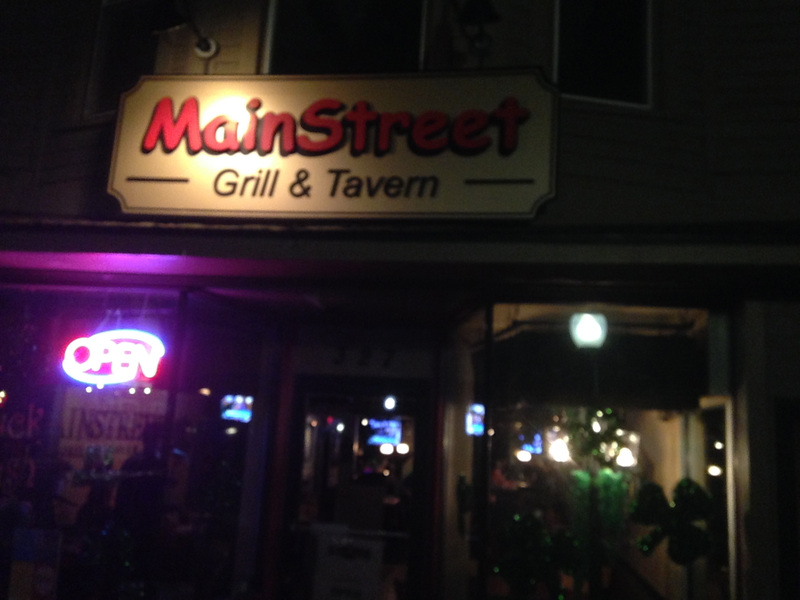 The Main Street Grill & Tavern was a new place for my Bride and me, though we have been going to Milford for a couple of decades together. This tavern was a delight and reminded me of some of the great watering holes in my youth, with a beautiful old bar that one really doesn’t see that much of any more. I only had two complaints, the first being that there was no place to dance, which is common nowadays and the other was that there were too many televisions, but this has been a gripe of mine for almost anyplace that I venture into any more; since they were having live music the televisions could have been shut off, but I guess I am in a minority these days. The tavern had a nice menu, and not just a “bar menu” and we enjoyed some grilled shrimp while we were listening to the music. As is my custom these days, I went looking for a business card for the establishment to add to this article, as matchbooks have long disappeared from the horizon, but they did not have any. So I had to venture outside and take a picture of the façade of the building, and please forgive me, but I am hardly a photographer. The other surprise that I had for the evening was the wine list, not extensive, but also not the usual assortment that one finds everywhere. My eyes focused on a Gruner Veltliner and the wine carte mentioned that this was a famous Austrian varietal, and since I have had a few of them, I was all set to order another bottle. 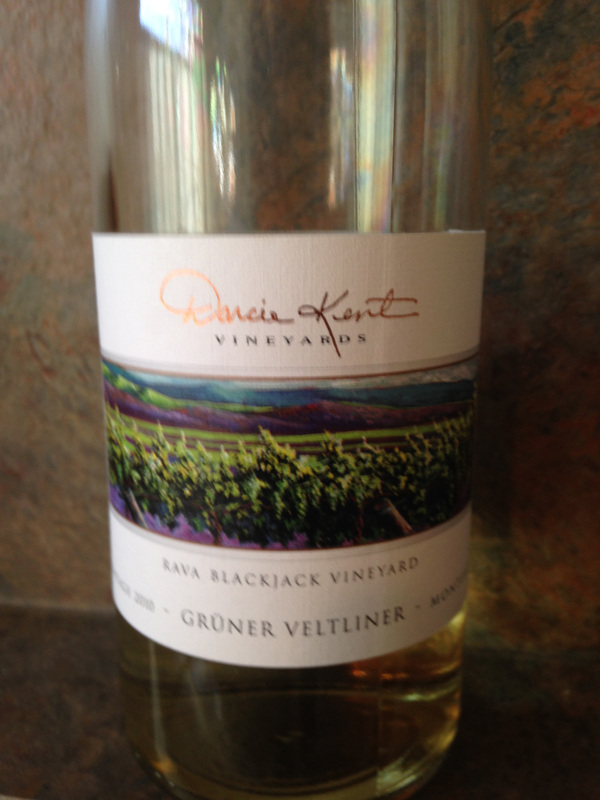 Imagine my surprise when I found out that Darcie Kent Vineyards Gruner Veltliner 2010 was from Monterey. As you may recall I really enjoy the wines that I have had from Monterey, as I even belong to a wine club from the region. This was a wonderful bottle of single vineyard wine from the Rava Ranch of the Blackjack Vineyards. It was a most enjoyable bottle of wine and the setting made it even that much more. I had great company, good music and a chance to see an old friend to boot; it really doesn’t get better then that. This entry was posted in Dining, Wine and tagged California, Darcie Kent Vineyards, Gruner Veltliner, Monterey, Rava Blackjack Vineyards. Bookmark the permalink.